The M.B.5 was the last prototype in a series of high-performance aircraft built by the Martin-Baker company in the mid 1940s. 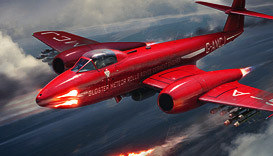 This fighter aircraft was distinguished by stunning flight characteristics. The highlight of the M.B.5 is its 2,340 horsepower V-12 Griffon 83 engine. Being a monster of a piston engine, it allows the M.B.5 to achieve a top speed of 440 mph (710 km/h) at medium-to-high altitudes. In addition, the MB-5 possesses a significant climb rate without sacrificing much maneuverability. 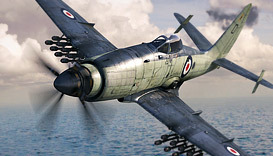 The M.B.5’s four 20mm wing-mounted Mk.II Hispano and generous 800 rounds of ammunition should give you plenty of time to lock on to your target!